I find the scent of fresh oranges intoxicating. Whenever someone starts unpeeling one in my presence, I'm immediately drawn to them (and I usually ask for a piece). So the brand-new Dial Vitamin Boost Super C Oil Infused Body Wash is definitely right up my alley. The moment you pop open the cap on this body wash, you're immediately hit with the scent of oranges. It's zesty, it's citrusy, it's fresh ... it honestly makes you want to drink the body wash right out of the bottle. Plus, it lathers up incredibly well and softens skin with the help of a Vitamin Complex, hydrating oil and Vitamin C. Perfect since this winter has been so mean to the skin! This body wash has been such a wonderful addition to my shower routine. I find myself reaching for it again and again -- I just can't get enough! 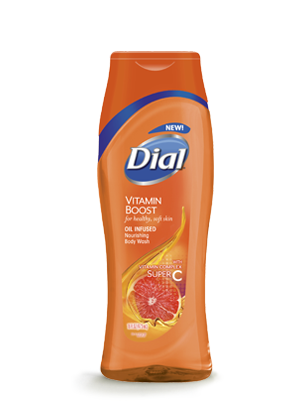 For more information about Dial Vitamin Boost Super C Body Wash, visit dialsoap.com.